The poppy sculpture Weeping Window by artist Paul Cummins and designer Tom Piper will open at Caernarfon Castle tomorrow, 11 October 2016. The venue will be the first location in Wales to host the iconic sculpture as part of the UK-wide tour organised by 14-18 NOW, the UK’s arts programme for the First World War centenary. A medieval fortress and World Heritage Site located on the River Seiont, Caernarfon Castle is home to the Museum of the Royal Welch Fusiliers regiment, who fought throughout the First World War, including the Battle of the Somme. A number of notable writers, including the poets David Jones, Siegfried Sassoon, Robert Graves and Hedd Wyn, served with the regiment during the First World War. The Welsh Government’s historic environment service, Cadw, organised a successful bid to host the monumental artwork at Caernarfon Castle in partnership with the Welsh Centre for International Affairs ‘Wales for Peace’ project. 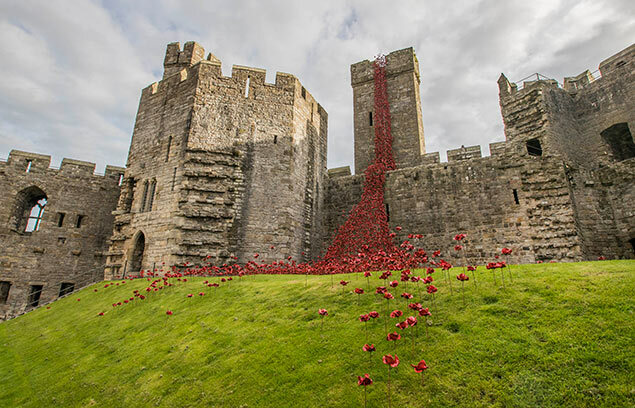 The iconic Weeping Window sculpture, a cascade of thousands of handmade ceramic poppies, will flow from the ramparts of the Castle to the ground below. The installation will be open to the public inside the Castle daily until 20 November. Morning and afternoon advance tickets are available for free online via Cadw’s Eventbrite, while an extra 1,000 people will be granted access on the door each day. The presentation will be accompanied by a special exhibition Remembrance for Peace. The exhibition will feature Wales’ iconic First World War Book of Remembrance – on loan from Cardiff’s Temple of Peace to the Royal Welch Fusiliers Museum – marking the lead up to Remembrance Day on 11 November, as well as the centenary of the end of the Battle of the Somme on 18 November. A ‘Peace Heritage Trail’ will take visitors around Caernarfon Town, starting from Oriel Pendeitsch, and a range of schools activities in Caernarfon will include the annual Wales for Peace WW1 Schools Conference and Peace Heroes Awards. Julie James, Wales’s Minister for Skills and Science, was able to visit the sculpture during an advance preview delivered by Wales for Peace volunteer guides, who, supported by Gwynedd Museums, will welcome up to 3,000 visitors a day through the exhibition’s six-week residency at the Castle. “This arrival of Weeping Window to Caernarfon Castle marks a significant cultural moment for the people of Wales. The loss suffered by those affected by the First World War was felt for generations, and this exhibition offers an important opportunity to remember and commemorate all those lost. Weeping Window is one of two sculptures taken from the installation Blood Swept Lands and Seas of Red – poppies and original concept by artist Paul Cummins and installation designed by Tom Piper – by Paul Cummins Ceramics Limited in conjunction with Historic Royal Palaces. The installation was originally at HM Tower of London from August to November 2014 where 888,246 poppies were displayed, one to honour every death in the British and Colonial forces of the First World War. Weeping Window is the cascade of poppies that was seen pouring out of a high window down to the grass below. The second sculpture, Wave, is also touring the UK. In 2017, the sculptures will tour to the Maritime Museum, Hull; The Barge Pier, Shoebury; The Silk Mill, Derby; CWGC Plymouth Naval Memorial, Plymouth; The National Assembly Building Y Senedd, Cardiff; and Ulster Museum, Belfast. The two poppy sculptures, Wave and Weeping Window, which together have over 11,000 poppies, have been saved for the nation by the Backstage Trust and the Clore Duffield Foundation, and gifted to 14-18 NOW and Imperial War Museums. 14-18 NOW are delighted to partner with transport sponsor DAF Trucks on making this historic project a reality. Financial support for the tour of the poppies has been received from the Department for Culture, Media and Sport and the National Lottery through the Heritage Lottery Fund. The learning and engagement programme for the poppies tour is supported by the Foyle Foundation.